Serious mental illness can devastate the affected individual, their family and their community. While great strides have been made over the last 100 years, much remains to be done to ensure that every individual with a mood or thought disorder receives the treatment they need and the respect they deserve. The people who are currently reconstituting PHEWA's Presbyterian Serious Mental Illness Network (PSMIN)are consumers and caregivers, professionals and people who simply care. Part of PSMIN's new strategy involves the establishment of network chapters in congregations or presbyteries who sense a call to this ministry. While a national steering team can do much in the way of resource development and advocacy, lives are touched and hope is reborn in supportive congregational settings. Presbyterians Today is the award-winning, general-interest magazine of the Presbyterian Church (U.S.A.). Published 10 times a year, it explores practical issues of faith and life, tells stories of Presbyterians who are living their faith and covers a wide range of church news and activities. Its October issue has been dedicated to an exploration of mental illness -- long a focus of PHEWA's Serious Mental Illness Network. 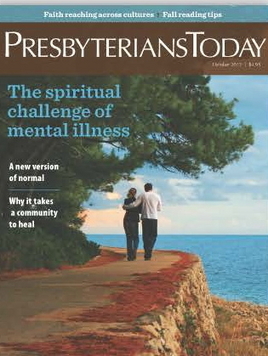 Presbyterians Today has graciously given us permission to make several articles from this issue available here at the phewacommunity.org website. To subscribe to Presbyterians Today, click here. Non-subscription single issues may be purchased through Presbyterian Distribution Services (PDS) at 1-800-524-2612.